Luciad created an Emergency Response Demonstrator as part of the Astute project to help firefighters accomplish their work more safely. The application is designed to make field operations faster ad safer. Each firefighter will be equipped with an on-sleeve mobile device with the application. 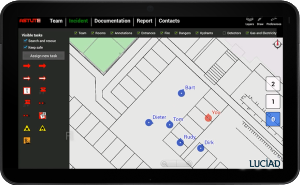 The Demonstrator assists the team by loading floor plans, giving info about the team’s positions and routing escape routes. 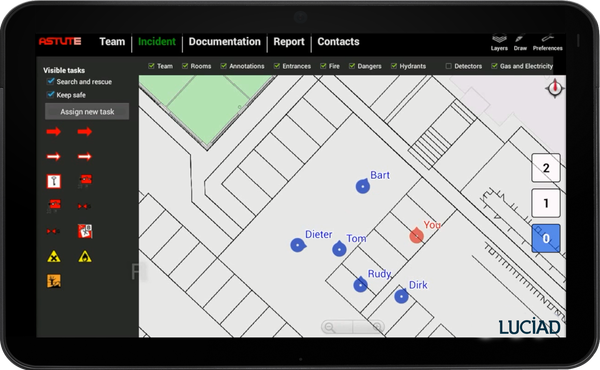 The command centre can follow the movement of the team and give information or voice commands when needed. This app was made in collaboration with iOS International, Namahn, Sirris, IBCN, Tekniker and Leitat.